I am starting a new series looking at home security & surveillance monitoring cameras. My fist blog in this series will be on the Uniden Guardian which we have been using at home (the G755) for a few years now, and I installed a newer version in the office building where I used to have AltamontCowork (the G955). That post will be coming soon, so check back. In the meantime, I have been visiting local stores (Best Buy, Costco, Staples, etc) to see what home security cameras are available. There are a few, and some look like they meet most, if not all, of my requirements. What are my requirements you ask? 2. Works on your home’s WiFi. 3. 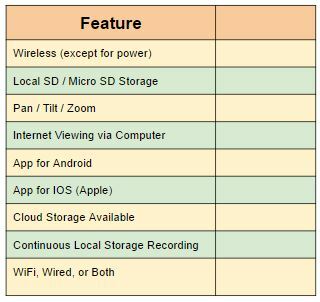 Local video / audio recording storage using an SD card or micro-SD card. There are some other features that are nice, but, I will get to them when I look at the individual products. UNFORTUNATELY, the only way to REALLY get to know how a device works is to live with it. I cannot afford to buy these products, so my research will be limited (unless I can find a benefactor or get demo units) to what I find online, and much of the time, that information is lacking. For example, Uniden does not say that spider webs or flying bugs at night really f**k up their camera….nor do they say that when you run out of memory in the G755 you have to re-format the SD card for it to record more…how stupid! But, that aside, I still think this is an interesting exercise and could be useful to many who just don’t have the time to look around at the various products. Here is the feature chart I will fill in for each product so when all the products are done, you have an apples-to-apples comparison for at least some features. I will look for more. If you know of any, please comment below. I just ordered and returned a Uniden UDR744HD 2 camera, 720p tablet based wireless system to Amazon. Why I bought it: The features I liked included a masking grid to eliminate constantly moving objects from triggering the alarm, 2-way audio, and 720p HD, compared to the 860 x 680 that most systems have. Why I returned it: It came with the 640X480 cameras (UDRC24) instead of the the HD cameras (UDRC34HD) they were supposed to come with. And Uniden told me their HD cameas are discontinued. So now I am looking at other camera-based systems. The ALC is the only other one that has the masking feature, which I consider essential for any serious motion-sensed videos. Question: For viewing areas between 15′ to 40′ distance, what feature would you consider more important: 720p resolution (compared to 680×480) or the masking feature? Interesting. There is another newish camera that masks. I will try to remember which one it was. I REALLY like the masking feature if only to filter out cars driving by the house. We have had to give our memory card to the Tracy PD because of a break in at the neighbors. Hi res would have been better than what we have now. I want both! 😉😆😆 Thanks for commenting. I kinda put this series on the back burner since it awfully expensive to buy these things just to test.